Press Release (ePRNews.com) - Carlsbad, CA - Oct 31, 2017 - Since its humble beginnings in 1956, Heppner’s Auto Body in St. Paul, MN, has grown from one location to six. 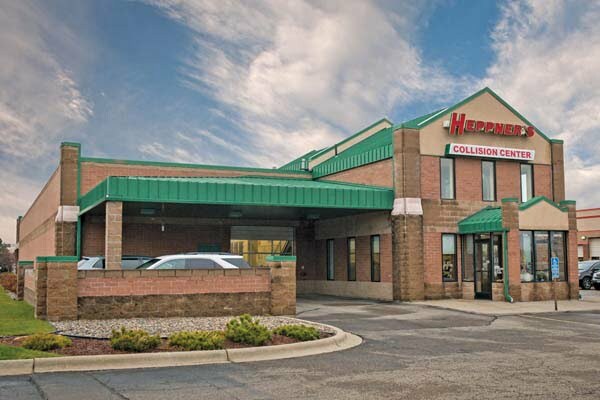 “The original owner, Elmer, sold Heppner’s to my father-in-law in 1985, who made it into a multi-shop operation (MSO),” said co-vice president Jesse Jacobson. His wife, Laura, is also vice president, while his mother-in-law, Linda Klatt, took over ownership after her husband, Bill Klatt, passed away five and a half years ago. We recently upgraded to 3M’s PPS 2.0 system with a quarter-turn locking lid. I asked the painters about it, and they had great feedback: It’s easier to use, has fewer moving parts, takes up less shelf space, and the clean-up is much easier compared to the original. He added that Heppner’s loves to promote employees from within. “Sometimes you can’t find anybody, and other times your inbox is overflowing with applicants,” Jacobson said. He added that everyone is aware that the technical schools are having trouble recruiting people, but they’re finding ways to deal with it. He added that another big challenge is keeping up with technology advancement, especially as an MSO. He added that it’s very important to make sure every location is on the same page. Training and building a quality team go hand in hand with providing employees with the most efficient equipment. He said that the MSO’s productivity has improved in the last several months thanks to these product advancements. Advertising is another big factor that contributes to Heppner’s Auto Body’s success. He said when a good advertising opportunity presents itself, he and Laura will take advantage. “We also have strong relationships with insurance agents, which helps with referrals,” Jacobson added. Jacobson and his team also reach out to the community by sponsoring sports teams and being involved with five local chambers of commerce. “We are always attending networking and training events,” he added. Relatively new to the industry, Jacobson said he’s been “pleasantly surprised” by how friendly other shops in the area are. Sign up to receive the free Autobody News electronic newsletter each week.